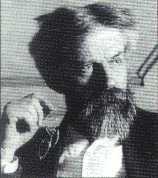 It was on this date, October 2, 1854, that the “father of town planning,” Scottish biologist Sir Patrick Geddes was born in Ballater in Aberdeenshire. He grew up in Perthshire, and studied variously at London, Paris, Edinburgh, and Montpellier Universities. Geddes traveled widely and taught physiology, zoology, botany, sociology, civics and natural history – becoming a radical only in the sense that unlike his contemporaries, Geddes believed humans prospered where there was fresh air, gardens and good housing. * Amelia D. Defries, The Interpreter Geddes, the Man and His Gospel. London: G. Routledge and Sons, 1927.